Green Day frontman Billie Joe Armstrong (pictured last year in Cleveland). 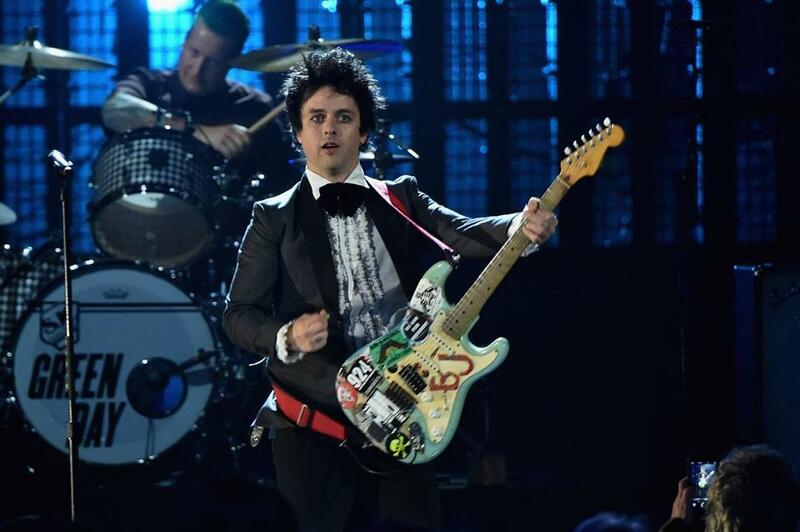 Billie Joe Armstrong started off Saturday's Green Day show at the House of Blues with a lesson. After bringing a young audience member onstage for a singalong to “Know Your Enemy,” a 2009 track that, like many of the Bay Area rock lifers' best offerings, pairs defiant lyrics with crisp riffing, he showed the young man to a section of the stage, then instructed him to jump into the crowd — not a bad way to be guided through one's first stage dive. It was an appropriate torch-passing for Armstrong, who began playing music when he was a teenager and whose band, which releases its 12th album, “Revolution Radio,” on Friday, turns 30 next year. After knocking around the Bay Area punk scene, Green Day’s 1994 full-length “Dookie” struck alt-era platinum, with Mike Dirnt’s tightrope-walk basslines and Tre Cool’s hyperactive drumming providing a springy base for Armstrong’s sneered depictions of slacker anxiety. The breakneck therapy session “Basket Case” and the wide-eyed appreciation “She” sped up powerpop’s melodic crunch and added alt-era anomie; Saturday’s performances of both showcased the band’s tautness, while the bouncing-ball breakthrough “Longview” was assisted by a ridiculously excited fan who transformed the song’s couch-borne alienation into a moment of rock triumph. In 2004 the band released the politically charged “American Idiot,” a sprawling rock opera that showcased their maturity and expanded scope. Focused on a “son of rage and love” named Jesus of Suburbia, its themes of a country gone astray still ring true 12 years later, and Saturday night's blistering performances of the punchy title track and the mini-epic “Jesus of Suburbia” felt incredibly well-suited to the current cultural mood. Green Day's newer material nestled in well with its older songs, particularly the buzz saw guitars of “Bang Bang” and the simply stated triumphs of “Still Breathing.” Armstrong's stage persona balanced yelping punk and arena-raising rock god. He goaded the audience into fanatic applause just as easily as he brought them to silence; he took time out between songs to remind the attendees of the power of love, as well as the importance of voting. “Remember: No racism, no sexism, no homophobia,” he said during a triumphant performance of the rumbling anti-conformity anthem “Minority.” “We all gotta come together.” He then offered up an expletive-laden anti-endorsement of the current Republican presidential candidate, which was met with cheers. The night ended with Armstrong, alone, on “Good Riddance (Time of Your Life),” a simply stated meditation on finding the good in lousy situations; while it's quieter than the band's other offerings, the hope shooting through it exhibits punk's agitation with the status quo. But that feeling of something more being out there has helped propel Green Day's ascent from teenage joke-slingers into rock elders, a journey that has produced some of the most potent tracks of the last 30 years.